Just got a message from Kitty Wu of 206 Zulu and The Coolout Network. 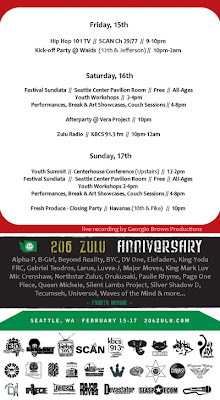 206 Zulu will be celebrating their 4th anniversary this weekend, Friday, February 15th-17th. 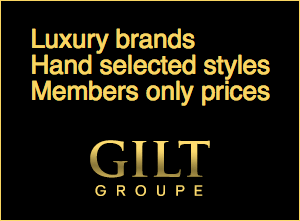 Be sure to click on the flyers above to enlarge. More details of this three day celebration by clicking here. 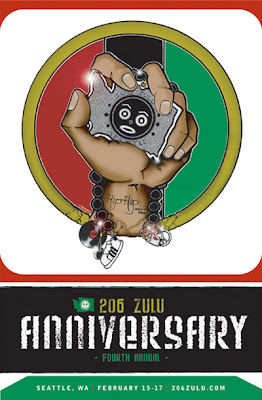 The 206 Zulu anniversary is this upcoming weekend (4th Annual). It is awesome this year, very segment-based, filmed live by Georgio Brown Productions. Plus a new segment/stage called Couch Sessions segments hosted by Piece with NW leaders being interviewed one-on-one. All-ages, all that good stuff.